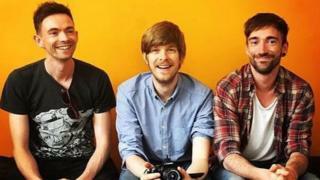 British band TTNG and US musician Mylets have been briefly arrested in Hong Kong over alleged visa offences. According to media reports, the band members were held after a raid by police and immigration officers on a warehouse venue hosting their gig. The founder of concert organisers Hidden Agenda was also arrested, the agency told the BBC. The British Consulate-General said it was providing support to several British men who had been arrested. Hidden Agenda events have run into trouble in the past, often over licence issues. Concert-goers posting on the promoters' Facebook page said about seven immigration officers came to detain the band members, citing issues with their work permits. As the situation got more tense, several police cars arrived with officers in riot gear and police dogs, said the witnesses. The three band members of TTNG, Hidden Agenda founder Hui Chung-wo and Mylets were then taken away by police and immigration officers. Hidden Agenda told the BBC on Monday that Hui Chung-wo had been arrested, while the musicians had been released but were required to check in with the immigration authorities later in the day. Hong Kong police confirmed to the BBC that several detentions had been made at the venue but would not give further details. Under Hong Kong immigration law, the band members could be charged with working without the required permit, while the concert agency could be charged with hiring the bands as illegal workers. Both offences can be punished with prison sentences of several years and hefty fines. TTNG and Mylets are currently in the middle of a tour of Asia with upcoming dates on Tuesday in Guangzhou, followed by concerts in Beijing and Shanghai. Have Hong Kong's youth lost hope in the future?